Why can't I control my Android device? Can't TeamViewer make it possible? 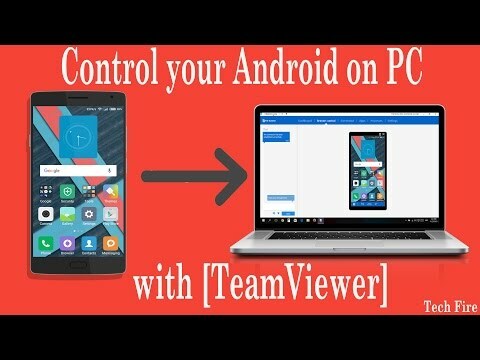 TeamViewer is capable of both viewing the screen and remotely controlling a range of Android devices. However, we unfortunately are not able to support all manufacturers or ROM's for these features, especially remote control. Screen sharing is available for most Android devices running Android 5.0 or higher. For remote control, we have a list of supported manufacturers in our article Supported manufacturers for remotely controlling Android devices. There are a small number of devices that are on our supported manufacturers list that are supported but are unable to download the add-on from the Playstore. This also occurs to some AOSP devices that may also be supportedbut you need to download from the website. We do support some AOSP devices. If you are running on AOSP it is best to download the app from our download page instead of the playstore. If you installed from our website but cannot control your device, it is not one of these AOSP devices and it cannot be modified to allow access. TeamViewer does not support custom ROMs. There is also no way to flash your unsupported device to make it compatible. But why not just make it possible? As this does require the manufacturers support, we cannot simply commit to making this possible as we cannot do it alone. What can I do to control my unsupported device? Unfortunately this isn't possible. If your device is unsupported, we are not able to provide you with this feature. I am a manufacturer, how can I get my device supported? After having estabilished the connection to the device, the screen is correctly displayed, but clicking is not working. Anything I can try? Also you may want to try the Quick Support version instead? See if that works. If that works and the host does not. I'd suggest contacting TV support directly to see if they know about an issue. I'm under a proxy in my university and I can't connect TeamViewer RC or Host, even though my proxy settings are fine. Every other application still works. Is there anything I could do to solve this? Edit 1: I'm also under proxy on Windows 10, however TeamViewer works fine. In the video it is straightforward. Once you have access you can move around the phone. However, i an only view my phone. I can't do anything. Now my phone knows my mouse is there and the same BLUE HAND that shows up on my computer shows up on my phone. I can also transfer files to my phone. But again, i can do anything with the phone itself the way i normally would using my mouse. I can't open anything, i can't swipe or move an icon. Nothing. I would appreciate you help and suggestions. Unfortunately, we do not have full control for all android devices and Motorola is one of the manufacturers we are currently unable to support. I am sorry for the any hassle. There shouldn't be an issue with what you are describing. Could you please try to disable UDP on both devices since they both are behind the proxy. This should force the app to go over TCP and be able to function with the Proxy correctly. I was wondering whether you could maybe post a slightly more detailed description of the problem you are encountering? I am sure this would help our other users to better understand the problem and allow them to make helpful contributions. I've got the same problem using Motorola Moto G 2nd edition running Android 6.0. When I click on my PC (Windows 10) a finger appears on both devices for a moment, but nothing happens anymore. Is there something I do wrong or how this problem can be solved? running the latest verison of TeamViewer, mouse click is still not working on Android after all troubleshooting steps have been followed. it would be really bad if it is not possible to remote control this device as unanttended access as this was the main reason we purchased teamviewer. I've been controlling a remote Huawei Android device with QuickSupport for the past few days. Today the device updated and now I get 'This device supports screen sharing only'. Any one have a smiliar issue? Can't control android phone properly, mouse interactions didn't work? I had sucesfully login with team viewer account on my computer, and then connect to my android devices. I'm using xiaomi redmi note 3 .
how can I made mouse interaction works? I have installed Host app on my Xiaomi Mi5 and when i connect to my phone using TeamViewer on my PC it tells me that my android device supports only screen sharing. How can i enable full control of my device? Same here: proxy is configured on my Android phone... When I need to use TeamViewer, I have to use my mobile internet connection. My laptop, on the same network (same proxy) works fine tho. please advise the solution. in the other phonesof miui7 it worked. Moto G 2014 LTE (Thea), running LineageOS Nightly build, After latest updates, teamviewer host became screen sharing only and cannot be controlled remotely. I have a huawei P10 and P9 with the same issue, can connect however only screenshare. Same problem with XIAOMI note 4. Is there anyone who has found how to solve this? Unfortunately Xaomi devices are not supported for screen sharing. We need the manufacturers co-operation for this which we do not have with Xaomi. Thanks for the quick update. I read somewhere that TeamViewer has decided not to develop the add-on for Xiaomi until there are good number of people using it and as per my perspective I guess most of the users are using Xiaomi products only. So I would just suggest if there is a way where team viewer can try again to take help and create an add-on for xiomi will help many users. I also have this issue with my lenovo yoga. as i see in this post people have this problem one year long. Does anybody know if this problem can be fixed, or where i can find suport from teamviewer team?. which is the solution? i have moto g4 play and i cant control my own device what can i do? same issue on Sony XZ Premium too. Recent update to TeamViewer Host causes a new component to be installed on the mobile when connecting remotely and finally allows remote control of Huawei devices!! Not for us... Huawei P8 Lite with Android 7 , Host V.12.3.7266 installed, no remote control. It actually installed "QuickSupport Add-On Huawei 2", Ver.12.1.6907 , and it connects, but the Remote Control option does nothing. Please, is there a fix for that ?? We need the remote option !! I FREQUENTLY CONFIGURE ANDROID DEVICES RUNNING THE MOST CURRENT ANDROID TV OS. THE DEVICES IN QUESTION ARE THE XIAOMI MIBOX (3rd Gen) AND THE NVIDIA SHIELD TV CONSOLE. I AM CURRENTLY RUNNING A TEAM VIEWER QUICK SUPPORT LICENSE FOR VERSION 11.0.76421 WHICH I AM USING ON A WINDOWS 10 DESKTOP. HOW DO I GAIN COMPLETE REMOTE CONTROL OF THESE DEVICES DESCRIBED ABOVE? (I WOULD LIKE TO CONTINUE USING MY CURRENT LICENSE AS IT WAS INDEED EXPENSIVE AND CONSIDERING SUCH I SHOULD BE CAPABLE OF REMOTING IN TO ANY DEVICE RUNNING THE ANDROID TV OS). It does seem as though it is the compatible devices. I installed Quick support on an S8 and I had the same blue hand with no clicking on the screen. I connected to an S7 Active and I had full control. Yes, that´s right. On two different mobiles it works perfectly (bq Aquaris X5 Plus & bq Aquaris X Pro). Using the Motorola Moto G 2nd edition it's not working. When will you support the new Nokia (HMD Global) Android smartphones for remote control? TeamViewer and Host are working fine, Host just does not yet allow to control the phone, it just displays a virtual finger for the operator to tap locally. On LG Nexus 4 and on LG Nexus 5 I also only see the "blue finger" and can´t control remote. What I have to enable for remote control? Galaxy Note 3, LineAge OS, Android 7.1.2 - same problem. Mine too, Xperia XZ Premium, any solution??? For my Gigaset GS170 (Android 7) the full remote control is not possible ("These devices can not be controlled by firmware restrictions"). Is there anything I can do about it? An app "Add-On: Gigaset" for Teamviewer QS is not available. I have an LG G4 cellphone. When it was on stock ROM (Android 6.0), Teamviewer worked perfectly for remote control. But when I updated to LineageOS 14.1 (Android 7.1), it no longer asks me for the add-on and says "This device supports screen sharing only"
It is the same hardware, so I don't understand. Incidentally, my Samsung S4 remote control works perfectly on LineageOS (after putting the add-on file in the right folder, problem known). were you able to resolve it. I can´t resolve it yet. No new informations from Teamviewer, no comment. I am hoping that the new Teamviewer that is in Beta right now will address some of these issues. The teamviewer update is focused quite extensively on mobile control so fingers crossed. Unfortunatley TW doesnt' support Xiaomi devices! "good number of people using it"
How can TeamViewer"people, know how many people want to use the app on their Xiaomi when they cannot use it? Did they asked people with a survey or something like that?